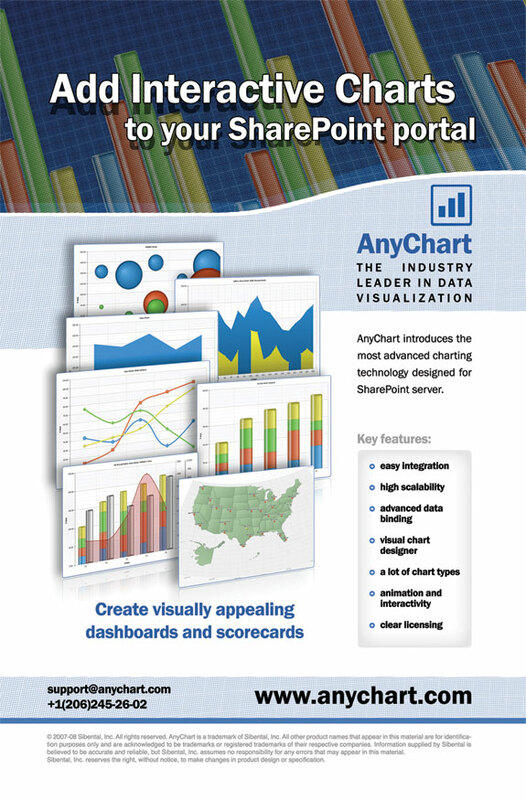 AnyChart introduces the most advanced charting technology designed for SharePoint server. Now you can add charts to your collaborative portals. This product is based on AnyChart charting engine and designed and optimized for Microsoft SharePoint. Any SharePoint user can implement charting capabilities now - simple wizard helps to configure charts quickly and easily with real-time preview and bind it to your data. There are a lot of chart types available and we are constantly adding new types. Animation and visualization effects will help you to represent any data in a best view. "Save as image..." and "Save as PDF.." features allow to save and share any chart from your portal by email. Create visually appealing digital dashboards and scorecards!